Democracy is the political form of commodity production. Once landowning, aristocratic and peasant societies disintegrated, the emerging dominant classes needed a new ideology, or set of ideas, to bind society together. With the peasants freed from obligatory custom and servitude, the church’s appeal and traditions waned in influence. Democracy appeared to be an advance. However, whether it is liberal or authoritarian, democracy is nothing but the management of the capitalist mode of production. It creates an overarching idea that dismisses or pushes off to the margins any idea of exploitation. It key concept that the “citizen” or the “people” are all equal is nothing but a fiction. It’s an important fiction that buries the reality of class warfare. It claims a political equality between, say, a Jeff Bezos, the billionaire owner of Amazon, and the thousands of minimum wage workers who create his wealth working for him, together with the millions who are desperate for wage work and so create a downward pressure on wage levels. Democracy is linked to commodity production in the way it explains our relationship to the larger society: One buyer: One seller. One person: one vote. One fare: One passenger. We vote like we pay the bills – alone, isolated and weak or one person up against powerful impersonal forces such as the money market and the national government. When we draw the curtain to cast our ballot we reject—or draw the curtain on—solidarity, the masses, the collective power of the working class. For a tiny ruling elite to rule over the masses of proletarians they must keep us divided, intimidated, and unaware of our own strength as a united class. Racism, sexism, patriotism and xenophobia are important weapons in the bosses’ arsenal. So is the ballot box. It is easy to underestimate the power of the ballot box. Look at May 68 – a mass spontaneous worker student movement that paralyzed the might of French capital only to collapse at the ballot box. 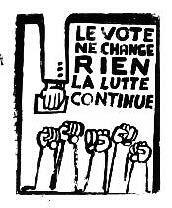 The slogan Le vote ne change rien (The vote changes nothing) was meant to tell the masses that they needed revolution, not voting for reforms. But the truth is that diverting the movement into electoral politics defeated the biggest uprising in a fully industrialized country in contemporary times. The ballot box was the final bullet in the defeat of the uprising. So the vote is not neutral—it actively sabotages the revolutionary movement of the masses. In El Salvador, after the 1992 Peace Treaty, the guerrillas, instead of fighting for power, became an electoral party. So, too, in South Africa. The ANC dissolved its revolutionary arm, the Spear of the Nation, in 1994 when it stood for election. It now is the party, as is the fmln in El Salvador, which administers capitalism. Our aim is to build the revolutionary movement that starts with the slogan “We the exploited,” that builds the solidarity and trust that can’t be built behind the curtains of a ballot box. This movement starts with fighting back against every capitalist attack with the understanding that we must put an end to this system. It starts with one person giving a fellow worker or student, a family member, or another passenger on the bus a communist leaflet or the latest edition of this newspaper. 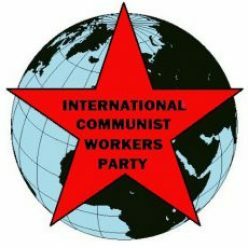 That’s the daily work of building the fight for a better world, which over time will create the conditions for the working class to seize power and build the communist world we need.